Do you like Mumford & Sons? I enjoyed "Little Lion Man" the first few times I listened to it. Then I heard their album. Every song followed the exact same structure, building to that final shouting crescendo. I can only assume that's why everyone jizzes over their live show. Jared & the Mill sound like a M&S knockoff, even cribbing a bit of the accent, despite hailing from Tempe, AZ. They're not horrible lyricists, so it's a little disappointing to hear their words set to the aped arrangements. The band is obviously at their best on "Confessions of an Outlaw" when they trade the Mumford sound for a twangy alt-country growl. 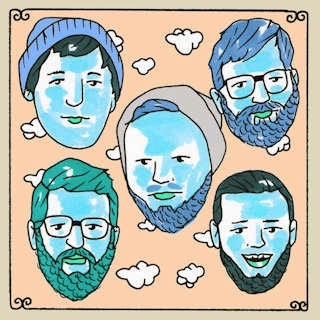 Join in the journey, and sign up for Daytrotter today.